← No science, no sustainability… the implications. The struggle to realize societal benefit from S&T. The reality for many (probably most?) members of these scientific communities is that as individuals we put rather more effort into the advance of our science and technology than into their application. This is understandable. That’s where the majority of us have been trained; that’s what we’re best equipped to do. And truth be told, for most of the history of these societies (a century or some cases a bit more), the biggest limitation to societal benefit has been the rudimentary state of our respective fields. That training has taught us a very important lesson: it’s hard to make progress in any effort in an undisciplined, haphazard, happy-go-lucky way. So we fall back on what we know. We recognize that usually the best use of the next hour of our time is spent advancing our discipline, and we blaze that trail. The resultant progress across the sciences and the engineering disciplines over the past century has been nothing short of phenomenal. And huge societal benefit is everywhere to be seen: increases in food production. Health care that can reduce mortality in childbirth and extend good years at the other end. Wealth and material well-being. For some. Many, to be sure, but only for some. Societal uptake has been patchy – occurring effectively here and there, but leaving the lives of millions, perhaps even a billion or so, relatively untouched, unimproved. One example, close to home: here in the geosciences, hazards warnings (ranging from a few minutes’ notice of a tornado to unfolding risks of climate change), though significantly better than those of just a few years ago, too-often go unheeded. In recent years, this has prompted meteorologists and other geo-scientists to take an additional step. Case in point? In an effort to be as disciplined in risk messaging, in communicating weather impacts as we are in risk detection, meteorologists have courted social scientists and brought them into our ranks as best we could. 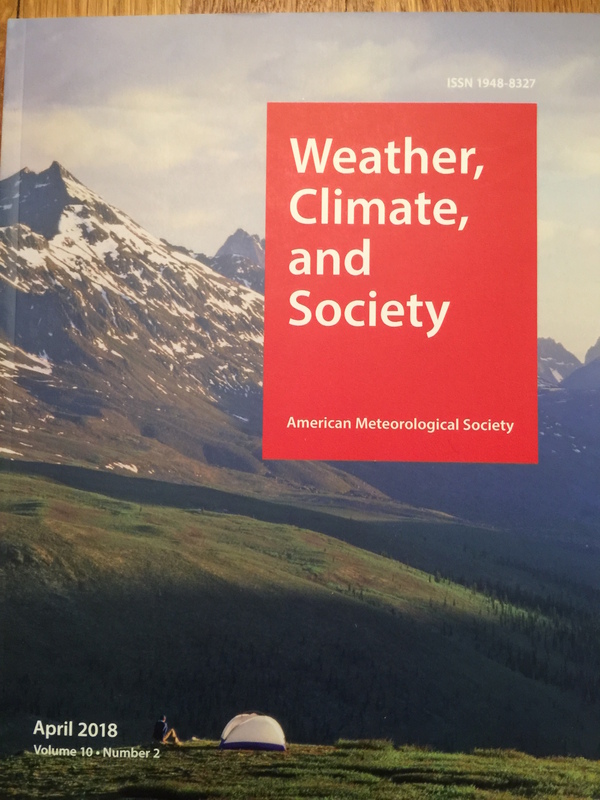 A decade ago, we established a “new” AMS journal, Weather, Climate and Society. We’re no longer content to operate on the basis of vague subjective impressions of the impact and value of our work. In the April 2018 issue of the journal (pictured), for example, articles look quantitatively at the impacts of changing climate on backcountry recreation, tease out data-based demographics of Romanian vulnerability to lightning strikes, the outlook for tornado damage in Florida, the effect of Midwest winter weather on Midwest aviation, and much more. Social science integrated with meteorology? Definitely an improvement! But we’re not there yet. It’s early days, so there is reason for optimism; it’ll take a while to get the collaboration fully up and running, let alone see the impacts. However, it’s difficult to escape the nagging feeling that societal uptake is still too slow. Not measured relative to the past; we’re definitely doing better. But looking ahead? We are not making progress at the rate that the rapidly evolving, more complex, fast-paced, problematic world of the future will need. In part that’s because social scientists, though social, are also scientists. Read their professional society mission statements and you’ll find they’re the same as those of other societies. Here’s one from the American Anthropological Association: to advance anthropology… (and) the dissemination of anthropological knowledge and its use to solve human problems. The American Political Science Association focuses on promoting scholarly research… and preparing citizens to be effective citizens and political participants. Their scientists are facing the same difficulties translating progress in understanding into widespread societal benefit as do their counterparts in the physical sciences. But we face a more fundamental problem – our numbers. AMS membership lies between ten and fifteen thousand. Only two people out of every million worldwide are members. But even adding in every other scientific and engineering association of every stripe, scientists and engineers nationally and worldwide add up to only a tiny handful of humanity. By contrast, societal benefit can only be achieved through changes in the everyday decisions and actions of the 320 million people here in the United States, or the seven billion worldwide. That, as much as any cultural barrier, limits societal uptake of science and technology. Speed of societal uptake varies; compare, for example, the uptake of cellular phones relative to the improvement in people’s diet in response to medical findings on nutrition. Both the successes and the struggles have much to teach us. Making a difference requires fresh approaches. More soon – but don’t wait for me. Surely you have your own good ideas. 4 Responses to The struggle to realize societal benefit from S&T. I enjoy the story from Britain during the Blitz, I think it was Gladwell that called attention to it. The Germans were dropping bombs on London, and Britain used air raid sirens to alert EVERYONE. But the bombs didnt fall on everyone. The people responded in fear and hid; and eventually they learned to ignore the sirens IF they couldnt hear the planes. RISKY! At first they needed the information provided by the siren, then they didn’t. The information wasnt specific enough. And yet they found a way to cope and survive and resist the attacks. So Im thinking maybe the struggle is that our simple and ironically, getting simpler, information will continue to miss the mark on accomplishing something useful for our various publics. Its the classic problem of delivering information too late relative to when decisions are made. This tension will always exist, cause you just dont know how much you need to know until you miss the mark. But even in missing our research marks, we can still provide our publics with actionable, specific intelligence to help everyone learn how to cope and resist the attacks from weather hazards. 🙂 Thanks, James, for this thoughtful comment. On point/encouraging! Like you, I attended the Natural Hazards Conference (NHC) in Boulder last month. One of the research sessions quickly became focused on implementing research findings. It’s a subject that is very complicated – different scientific disciplines, different implementation regimens, different understanding of what implementation even means. And yet, there are commonalities. In medicine and many of the social sciences, on average it takes about 14 years to go from scientific finding to successful implementation. If we look at the Department of Energy’s nuclear cleanup program, we see exactly the same average rate of uptake of new technologies. In discussions at the NHC, there was one striking commonality between these rather disparate endeavors – a “technologist” who can translate from science to solutions of practical problems. In the hard sciences, these may be engineers or entrepreneurs with a profit motive. In the soft sciences (except for finance), we don’t have technologists in the same sense, perhaps this is what we’re really looking for: those perceptive enough to grasp a practical problem and insightful enough to bring the right science to bear on its solution. apologies for the belated response,/meant to reply earlier…but couldn’t agree more with your point. We need more such translators… or science worthy of translation.